A&E units in England are being given strict guidelines on how many staff they need on duty to provide safe care. The draft guidance from the National Institute for Health and Care Excellence recommends one nurse for every four cubicles. But it said for major trauma or cardiac arrest patients, there needed to be two nurses for each patient. And it said numbers needed to be kept above what average demands were to cope with the unpredictable nature of A&Es. Currently it is up to local hospitals to decide their staffing levels – and unions argue there are not enough on wards. The guidance, which will now be consulted on, also calls for senior nurses to look out for red flags that may show something is wrong, such as patients falling or leaving the department without being seen. Prof Mark Baker, from NICE, said: “Nursing staff are often among the first to see patients and we know the care they provide is essential for successful treatment of every patient. NICE said it had not yet gathered data on how many hospitals were failing to reach this standard. 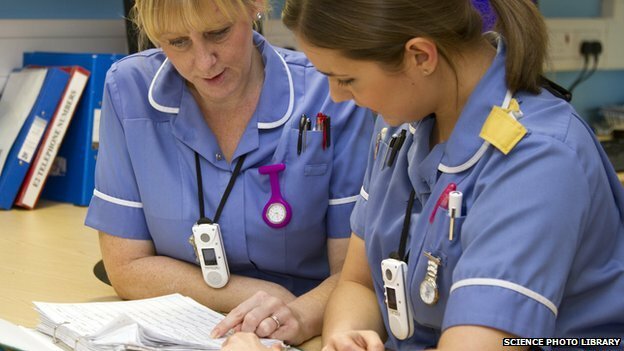 However, evidence collected by the Royal College of Nursing shows vacancy rates for junior nurses were hovering between 10% and 20%. Senior nurse numbers were also short too, the union said. RCN general secretary Peter Carter said: “For years now, many A&E departments have been understaffed or staffed with temporary or less experienced nursing staff. The recommendations have been published in the middle of one of the most difficult winters for the NHS for a generation – although they were being planned well before winter started. A&E units missed their waiting time target for the last three months of 2014 with just 92.6% of patients seen in four hours – below the 95% target. It was the worst quarterly performance since the target was introduced a decade ago. A Department of Health spokeswoman said there were now more nurses in the NHS than when the current government came to power. “This NICE guidance will give the NHS evidence to make sure it has the right number of staff, improving patient care,” she added.